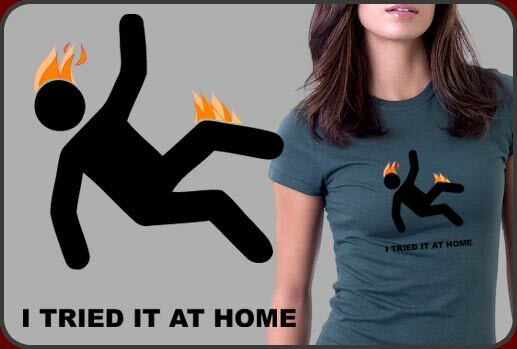 Very funny 'I Tried It At Home' T-shirts. This is a hilarious t-shirt design that will earn plenty of laughs. The warnings always say "Don't try this at home." But surely those silly warnings weren't meant for you. You are a free spirit, ready and able to take on even the most dangerous and destructive feat seen on television. The fear of breaking bones and burning alive is nothing to you. This is a very funny graphic t-shirt that always gets lots of laughs.